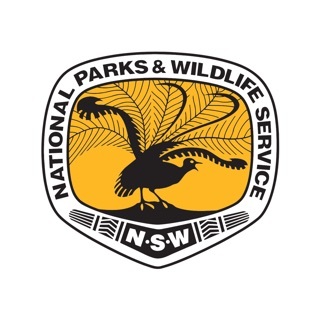 The Greater Blue Mountains World Heritage Area is Australia's most accessible wilderness. Just 90 minutes from Sydney, the region stretches over one million hectares with a mix of rainforest, blue-hazed valleys, sandstone escarpments, canyons and heathlands, with plenty of outdoor adventure activities to keep you entertained. Also renown for being a part of the Slow Food movement, the region offers many cafes, restaurant and bars, plus antique & vintage shopping, unique arts and crafts and boutique accommodation. 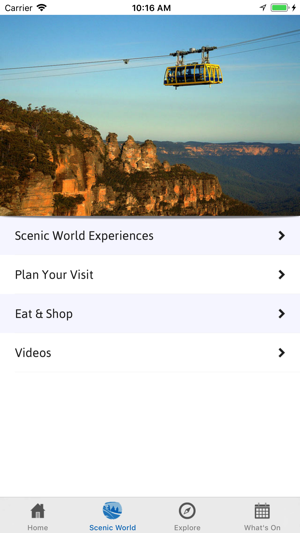 The Blue Mountains Australia app is the best mobile tool for planning a memorable Blue Mountains getaway. 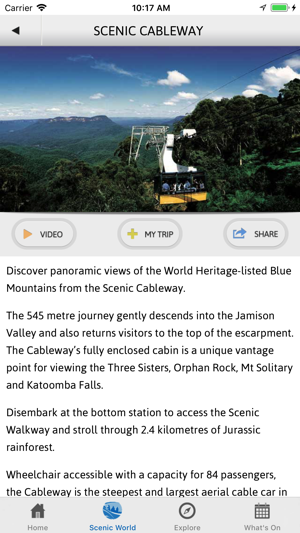 * SCENIC WORLD - explore everything you need to know about planning your visit to this must see attraction - home to the world's steepest train! 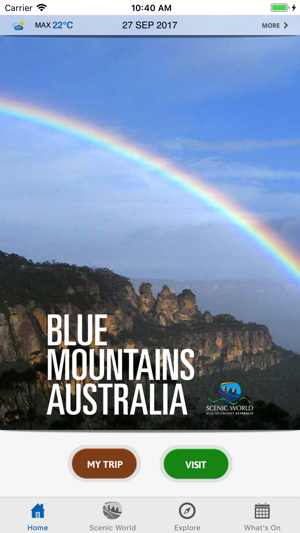 * REWARDS Enjoy discounts and offers from leading Blue Mountains attractions and then share with friends on Facebook and Twitter. The more you visit, the more you're rewarded! 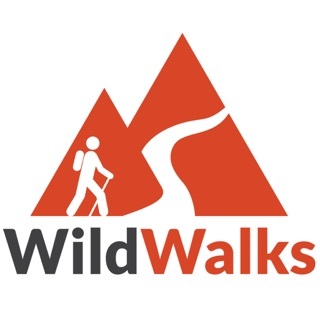 * MY TRIP Build, customise and update your ultimate Blue Mountains itinerary, saving all your must-see and must-do items. * NEAR ME Explore the interactive map to display places of interest in your immediate vicinity. Filter and refine your choice or be spontaneous and discover new villages, cafes, boutiques, galleries and more. 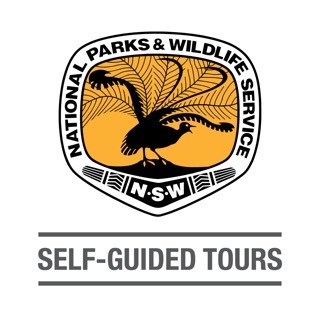 * EVENTS Stay up to date and plan your next Blue Mountains visit to coincide with our diverse calendar of local festivals such as the annual Sculpture at Scenic World, plus exhibitions and happenings. Improved iOS11 support. Removed rewards that are no longer offered. Couldn’t be worse! Huge disappointment. I’d give it zero stars if I could. Where do I start? 1. What’s on section is empty. Over school holidays and Christmas? Not quite true now, is it? 2. 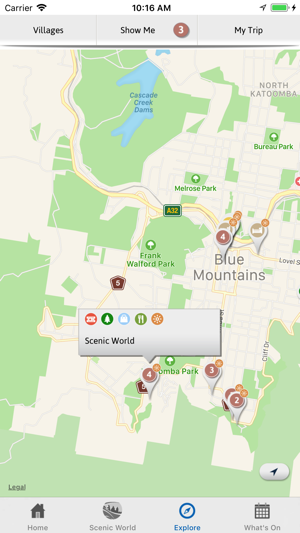 This represents itself as a Blue Mountains app but the main content is generic Scenic World info you could read in a one page brochure and 3. nothing about their current Dinosaur installations running for a few months. 4. Sculpture at scenic world section says (null). 5. 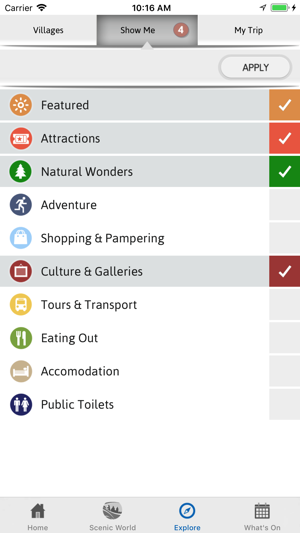 The explore section does have useful maps to find local attractions but poorly done. Why have an icon on a map showing a lookout, then describe in a single sentence it’s beautiful, yet not show a photo? Half baked. 6. Photos which are included are shocking. See 3 sisters visitor centre showing the inside of the shop! Huge missed opportunity to show the panorama with the visitor centre in context. 7. Zooming in and out on the map makes icons disappear. Could be a great app but needs a serious overhaul. This app is a complete disappointment. It is a random collection of places in the Blue Mountains, but many (most?) of the major attractions are ignored. The focus appears to be on commercial enterprises. Are any of the lookouts listed on the map? Not for any the the common ones that I checked for. For example, even the Three Sisters are not on the map, despite them being on the app's button! I've deleted it. Great! 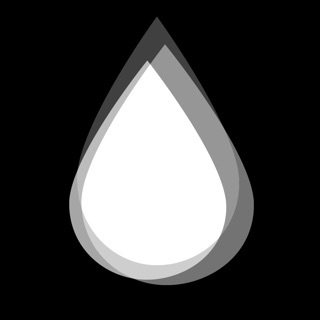 Easy to use and full of information. 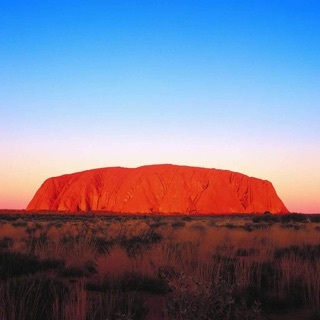 I'm a frequent visitor to the BM's from Sydney and i love the My Trip feature. lots of good places to go.